In 2009 SMS saw the need to expand outside restaurant seating throughout the downtown but particularly on Osceola Street from Second Street to Colorado Avenue which is the main pedestrian street in the historic downtown. 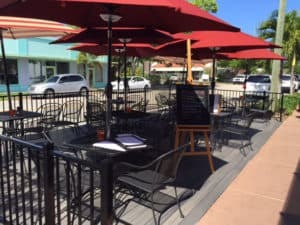 The major challenge facing this proposal was the narrow street and sidewalk area that severely limited the ability for restaurants to add any meaningful outdoor dining seats. One idea that SMS began to evaluate was the removal of one or two key parking spaces in front of the restaurants that had expressed a desire to participate. With that goal in mind SMS commissioned a study to look at where those opportunities existed and how much parking would be lost. After a year- long analysis with City CRA staff it was determined that six outdoor dining areas with a loss of eight parking spaces was desired and possible without have a major negative impact on parking. Today that number may increase to eight dining areas. Colorado Avenue is the primary gateway to historic downtown Stuart from U.S. 1. It serves as the primary corridor for commuters driving to numerous work destinations to the east of U.S. 1 including Martin County’s largest employers. As a four-lane road, it was not pedestrian friendly and the heavy vehicular traffic usually moved faster than the posted speed limit. Years prior, the City of Stuart had made two previous unsuccessful attempts at gaining support for making Colorado Avenue more pedestrian-friendly. Then in 2011 Stuart Main Street (SMS) and two traditional neighborhood advocates, Julie Preast and Ann MacMillan, who were also former SMS board members and retired downtown merchants, took on the task of educating the community and garnering support for the proposed road diet concept which would reduce the road from four to two lanes, add medians with turn lanes and feature public art pieces, include landscaping/cross walks/bike paths from Martin Luther King Boulevard to Confusion Corner, and install pedestrian seating and a roundabout that would also serve as a gateway into the East Stuart neighborhood — all designed to create a pedestrian-friendly street with slower moving traffic that would entice individuals to walk and shop. On March 23, 2011 the City of Stuart held a well-attended public meeting to discuss the Colorado Avenue design, and citizens expressed their concerns (comments presented by Julie Preast are attached). Julie and Ann visited every available business and property owner along Colorado Avenue to invite them to participate at Dan Burden’s tour and presentation, provide the proposed design and relay their past experience with accomplishing Downtowns revitalization. Dan Burden is considered an international expert in walkability, bikeability, traffic calming and road diets. Julie contacted Dan and he agreed to assist the City of Stuart by conducting an audit/walking-tour of Downtown and present the results. On April 20, 2011 Dan Burden, founder and former Executive Director of the Walkable and Livable Community Institute, that promotes healthy, connected communities supporting active living, guided a walking tour through Downtown accompanied by members of the public (see attached notes and sign-in sheets). That evening Dan gave his presentation on “Livability and the Role of Transportation” to the public within City Hall. He presented the results of his downtown walking tour, opportunities for improvements and the elements of the road diet design for Colorado Avenue created by Joe Capra of CAPTEC. Dan’s presentation and answers to questions assured the community of the significant benefits derived from a road diet. On April 25, 2011 Julie Preast appealed to the City of Stuart Community Redevelopment Agency for the use of Community Development Block Grant funding for the Colorado Avenue road diet project (see attached). Colorado Avenue is within the boundaries of the Community Redevelopment Area. Today, four years after construction was completed, Colorado Avenue is a vibrant, attractive and safe place to drive, walk, shop and work. Business revenue and rental income have increased and occupancy levels are at 95% from the pre-construction 70%. Stuart Main Street is proud to have played a role in the expansion of the downtown Stuart experience with the new, friendlier and much safer Colorado Avenue. 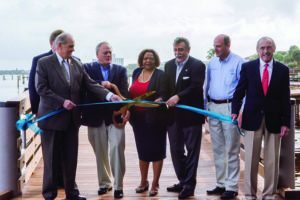 With the goal of adding a new 400’ section of boardwalk between the Riverwalk Stage east to the Colorado Avenue pocket-park along the shores of the St. Lucie River in historic downtown SMS working with the City CRA and City Manager proposed an arrangement that allowed the landowners along Seminole to be included in the parking- exempt area of downtown for their granting riparian rights to the City to build the boardwalk. The Seminole Street area remains an excellent opportunity for continuing redevelopment of the historic downtown. First, thank you all for your support and participation in the City Hall Public Input meetings. Whether you helped develop the input process, participated as a stakeholder, attended or spoke at a meeting, or covered the process in the media, your input is greatly appreciated. CRA for Capital Projects to build property values in the city. spots leased by the City from FECI. Earning Coastal Living “Happiest Seaside Town in America” recognition. bringing some 250 people to Stuart September 8-11. Hosted a regional Main Street 1010 class. Anticipate hosting a quarterly FMS meeting in 2017 including screening the film Urban Century. Partnered with Stuart Heritage to bring Heritage Day tours of significant commercial buildings downtown. members and the larger community.